Complex manifolds are typically made up of valves, solenoids, pneumatics, or flow restrictors, and are considered to be a subset of custom fabrication or design fabrication manufacturing. Manifolds offer a variety of benefits when included in a simple or complex assembly. Whether simple or complex, manifold assemblies offer a centralized location for connecting multiple valves with in a system. There are two main types of manifolds, each of which can be further broken down. The type of manifold required will depend on the system type, size, and purpose. The two main types of manifolds include a single-piece design, and modular block design. A single-piece design is meant to support all necessary valves within a system, and is made up of all passages within the system, in one piece. 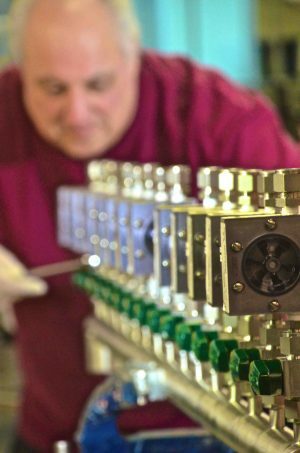 A modular-block design, on the other hand, typically supports just one valve, its internal passages, and flow-through provisions. In a modular block design, there will usually be several modular blocks which are connected to each other, and which make up the entire system. There are advantages to each type of manifold, and which type will work best for your system is based on several factors, such as how much space is available, the intended function of the system, budget requirements, and more. As mentioned above, manifold types can be further categorized into subtypes. Laminar-type manifolds consist of multiple layers of metal (or plastic), with passages machined through them where necessary. Each metal or plastic plate is stacked, allowing for a variety of fluid passages depending upon the shape of the overlapping passages. Once the end pieces are added, the stack is then brazed together. Almost any flow rate can be reached without a significant pressure drop, due to the ability for the internal passages to be cut into various shapes and sizes. Laminar manifolds can handle pressures up to 10,000 psi, and allow for an unlimited number of valves (of various sizes) to be mounted on the manifold. These types of manifolds are custom-designed, allowing for valves and other connections to be placed where necessary based on the particular application. One restriction that comes with laminar-type manifolds is that it can be difficult to modify if necessary, as the flow passages and construction create a relatively permanent system. Drilled block manifolds consist of a metal (or plastic) block, which is drilled, creating flow passages to meet specific design preferences. The consolidation of components within a hydraulic valve block allows for fewer fittings and a neater layout, in addition to shortening assembly time and eliminating leakage and sudden pressure drops. With this type of manifold design, the drilled passages must be straight, which results in some limitations, though it does still allow for location of valves as necessary. 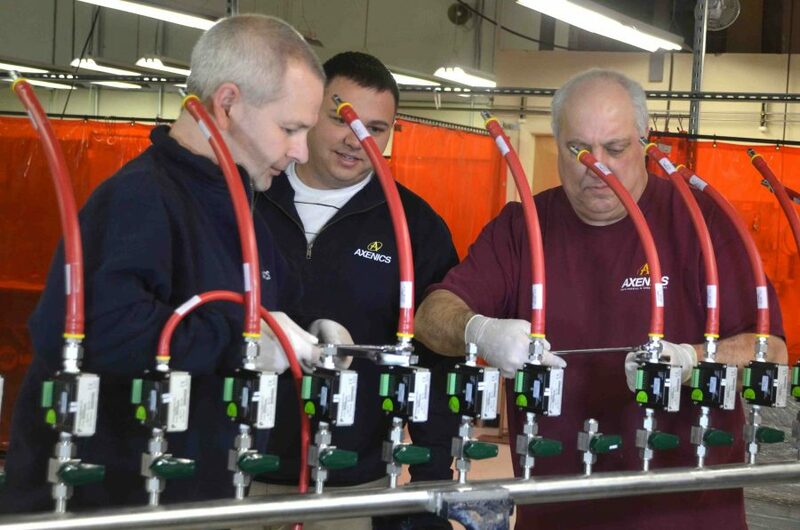 Unlike single-piece manifold systems, modular manifold systems are much easier to modify when necessary. The majority of modular systems can also be bench-assembled horizontally and stacked. End plates are usually placed on the assembled manifold to seal it, but can also be drilled for the purposes of connecting to pumps and tanks. Interconnecting, divider, and spacer plates, which redirect flow from one passage to another, or stop flow between blocks, are usually installed between the main building blocks. Spacer plates specifically help to increase dimensions between main blocks when necessary. The tops of the main modular blocks are ported and drilled for connecting subplate-mounted valves. Blocks are usually available with different ports based on the valve and subplate type, and plates are identified based on the type of valve they are made to accept. There are several benefits to using a manifold system, some of which include cost savings, space savings, fewer leaks, and easier maintenance. Among these benefits the cost savings associated with assembly and installation, as well as the reduction in space requirements are the most significant. Axenics has expertise in producing a variety of stainless steel and plastic manifolds, depending on the needs and specifications of our customers projects. Our staff is trained and certified on all manifold operations performed, ensuring that proper welding techniques are followed to avoid deformities. We produce both simple and complex manifolds, ranging from no bends to multiple bends and end fittings.